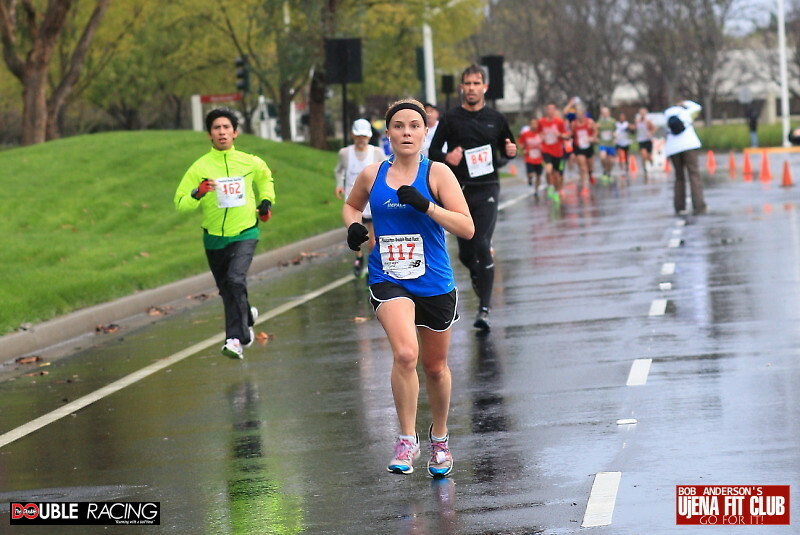 Pleasanton, Calif., Sunday, Dec. 23, 2012 – Running in intermittent rain and gusting winds, Fernando Cabada, Tina Kafalas and Christine Kennedy were the big winners at the Pleasanton Double Road Race™. 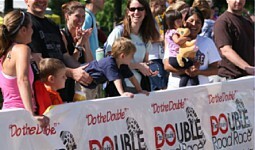 The first time the Double (created by Bob Anderson) had ever been held in America, the event marked the birth of a new sport – and the way the competitors , some 700 of them, ran the race, which consists of a 10K opening leg, followed by a concluding 5K leg, with a recovery break in between, clearly established the Double at a valid, bonafide athletic competition. Cabada, a world-class runner from Boulder, Colo., who holds the American 25K record on the road, won the men’s overall competition by running the 10K leg in 30:31 and the 5K leg in 15:02 for an aggregate time of 45:34. Daniel Tapia of Prunegrove, Calif., near Salinas, finished second with an aggregate time of 46:03, and Tyler McCandless, also of Boulder, Colo., was third with an aggregate time of 47:13. Tina Kefalas, who now lives in Hillsborough, Calif., but represented Greece in the women’s marathon at the London Olympics earlier this year, won the women’s division by running the 10K in 35:55 and the 5K in 18:07 for an aggregate time of 54:03. Michelle Meyer of San Francisco was second, posting an aggregate time of 54:42, and Heather Tanner of Menlo Park, Calif., finished third with an aggregate time of 56:14.